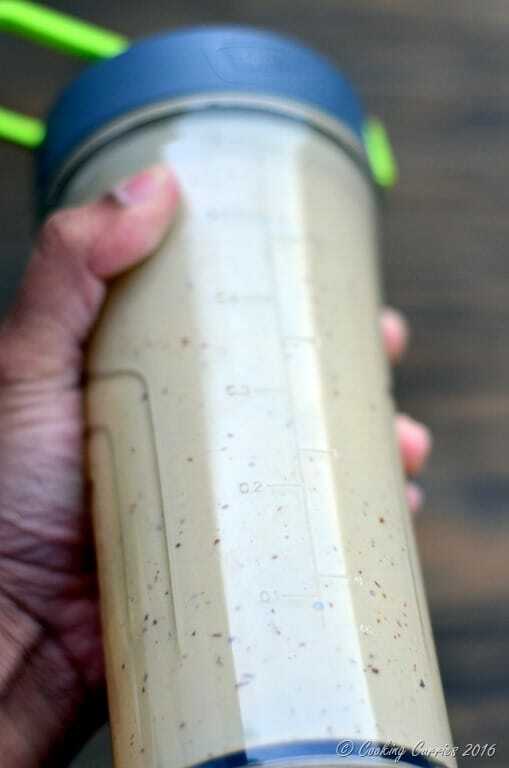 A quick and easy protein shake with a tropical twist, this Vanilla Mango Lassi Protein Shake is perfect as your breakfast, post / pre-work out drink or just something substantial to keep you going when you are out and about! This is just a snippet of my mornings. There are a few dozen more questions and statements made in the few hours from the time V is up to the time he gets to his pre-school. Getting him ready, making him breakfast, getting him to eat his breakfast and getting him out of the house into the car and driving him to his school, sometimes leaves me no time to make anything for me to eat. I manage to make myself a cup of coffee in the morning, that’s it. That’s also because I really wont be able to function without it. And the days that I have not eaten breakfast, which is most days, I make a trip to the coffee shop as soon as I drop of V and get myself a large coffee! Caffeine was my answer to getting the energy I wanted. 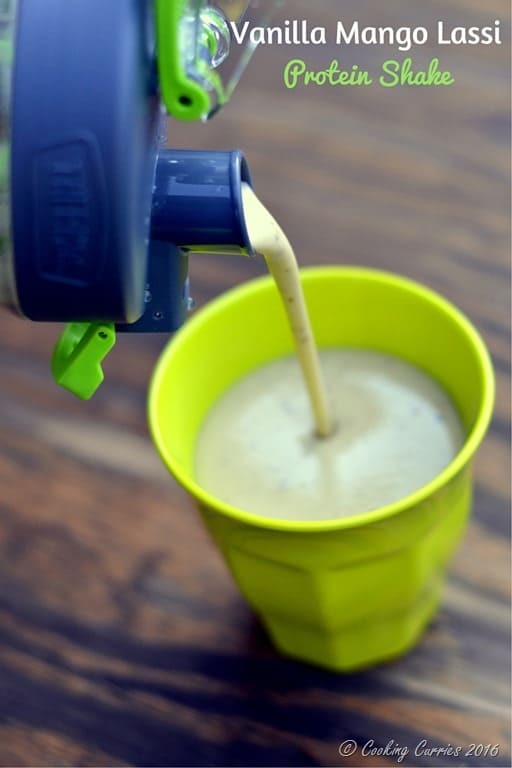 It took a toll on my health and I decided to make myself something that I can drink on the go – without compromising on the taste and protein component. I started making myself smoothies in the morning. I needed that after dealing with my work out of getting the kiddo out of the house! (not all days, some days, he is an angel of a kid! I have to say that, though)The only problem was to take out the blender every single time to make the smoothie, remember to put it back and all that. It was too much to do in the little time I had dodging all the questions and managing tantrums of the kiddo. I hate having a lot of things sitting on the counter top, so I refuse to keep the blender up there. That’s when I got my hands on this Thermos Brand Shaker Bottle. 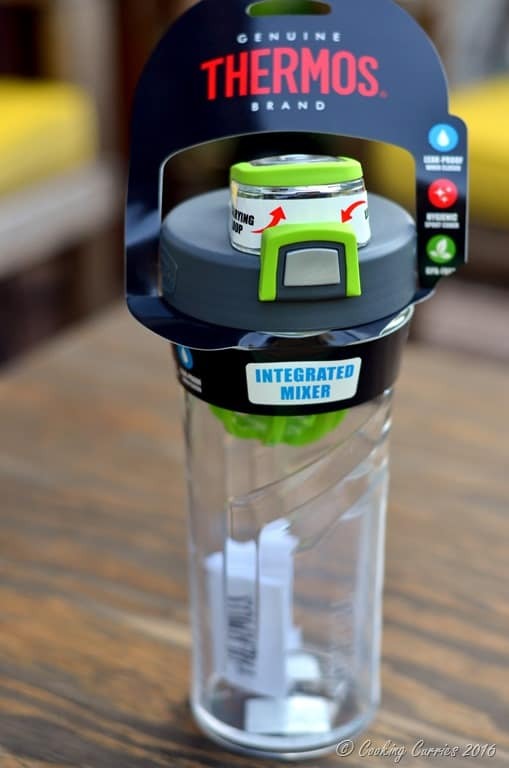 It is this genius of a bottle with a whisk like shaker in it, that will shake-blend your smoothies in no time and you can drink up from the same bottle without having to pour it into another bottle or glass to drink it. At first I wasn’t too convinced that this could do a good job, but if you follow the instruction of adding the liquid first and then your solids – protein powder and such, it does an excellent job of blending it all up, that you will have a hard time believing that I didn’t use a regular blender for this. The only drawback if any, is that you cant use any solid chunks in it, like bananas – which is usually what I put in my smoothies. But that is just a small price to pay for everything else this has to offer. Best of all, I just need to take this bottle out of the cabinet and add things to it, shake it and drink it. I don’t have to take out the bulky blender, plug it in, put the jar on, remember to put the blender back and all that! I love fruits in my morning smoothies and shakes and that is pretty much the only time I consume fruit during the day. So my smoothies most always have a fruit component to it. 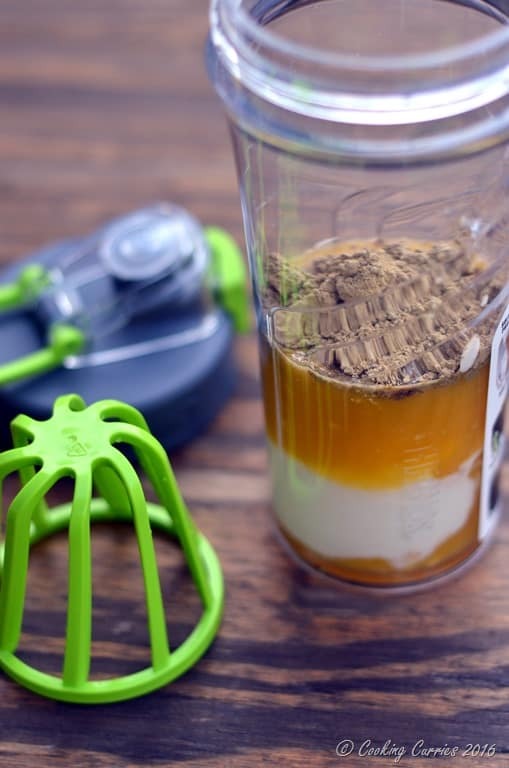 Since this is not a blender, I try to puree the fruit ahead, so I can just add that to the bottle along with milk or yogurt and my favorite protein powder and all the other add-ons. In summer, when we buy mangoes in bulk from Costco, I usually puree a whole lot of them and keep them ready to be used in anything and everything I want. It is easier this way to make sure they don’t get spoilt. And because mangoes are in season now, I love using them in my morning smoothies. 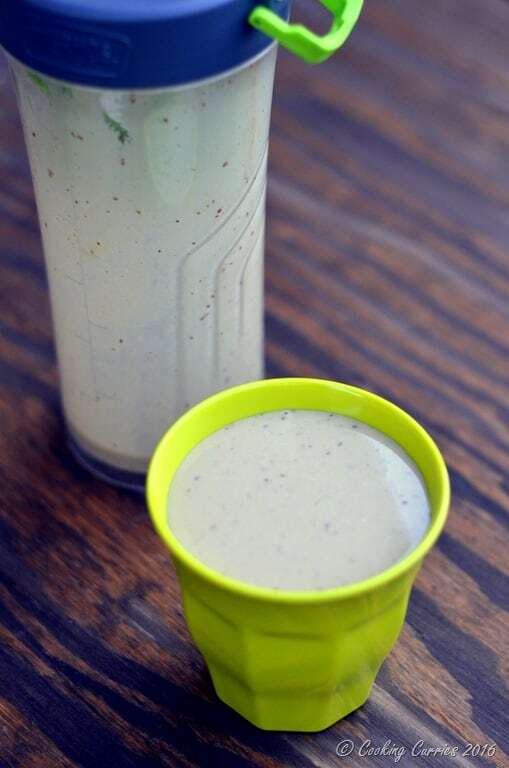 This is a quick and simple Vanilla Mango Lassi Protein Shake with some pureed mangoes, Greek yogurt, vanilla protein shake (plant-based and that is why that color you see in the picture), some almond meal and a touch of cardamom. It makes my breakfast taste like dessert and not breakfast and that I think, is a great start to the day. The Thermos Brand Shaker is also super easy to clean. Just add some soap and warm water and shake, baby, shake! 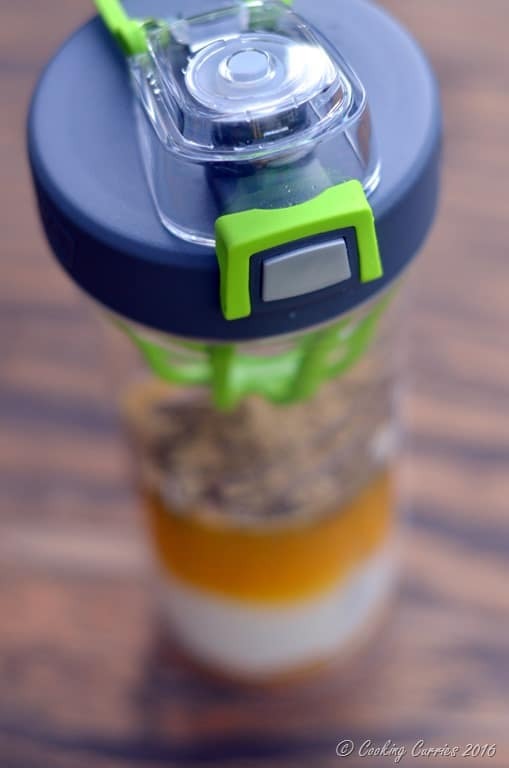 Rinse it off and your Shaker Bottle is ready for the next day! Definitely way easier than getting your pre-schooler ready for the next day of school And even better, it doesn’t ask you a ton of lot of questions! 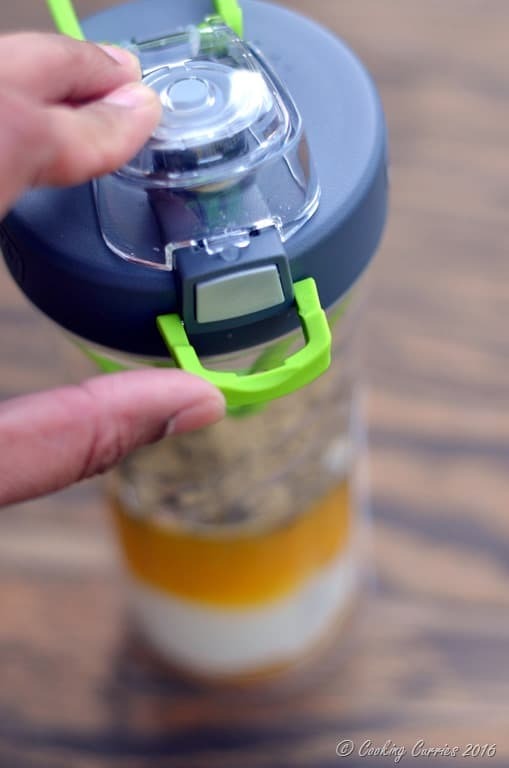 Add all the liquid to the Thermos Brand shaker bottle. Add the protein powder, almond meal, flax meal and ground cardamom. Close the shaker. Don’t forget the lock! Shake Shake Shake and enjoy your shake! Thermos is running a limited time promotion that gives readers the chance to win a Genuine Thermos® Brand Shaker Bottle through a sweepstakes that is hosted on the Thermos brand Facebook page. There will be a total of 10 randomly selected winners for the promotion. If you want to be one of the lucky 10, go check out their Facebook page for the details! What a great kitchen tool! I have never seen this before. Hi the link to enter says – content not found..pls check. Bindiya, I just checked all the links. They work. If the link takes you to the Facebook page of the brand then that is correct, that is where you ahve to enter. How cool is this product?!! It’s perfect for an on-the-go meal, and a great way to start the day! We just had mango lassi today. Never occurred to me to add vanilla to it. Definitely trying your version next time. Must get me one of those thermos. It was a wonderfully pleasant combo! Ahhhh, laughing like crazy right now because your morning sounds a whole heck of a lot like my mornings. Gosh those kids can ask a lot before 9 am can’t they?! Great sounding shake. I love playing around w/ smoothies and shakes. Adding to my list!